~ The Frugal D.I.Y. Mom ~: The "Kids-Won't-Know-It's-Carrots" Pink Smoothie! - Great for Valentine's Day! If you have kids, you know how difficult it can be to get them to eat raw veggies! I am getting good at hiding the cooked ones, but crunchy carrots are tough if they aren't hidden in a pool of Ranch dressing - and sometimes that doesn't even work! I have tried SO many smoothie recipes promising that the "kids won't know". Some were OK, but I think some people must have given the kids hot sauce first before washing it down with the broccoli smoothie so they wouldn't taste it! YUCK! :) I also have to say that I am NOT a fan of veggies at all...so I was secretly hunting for a recipe myself! First of all, you have to have frozen fruit. So many recipes call for ice. Blah. Why drink frozen water when you can get some antioxidants and fiber in there! To freeze fruit: just take your fresh fruit and spread in a single layer on a cookie sheet or jelly roll pan. Stick it in the freezer until they are frozen. Then place them in a Ziploc bag to freeze together, that way they don't stick to each other! 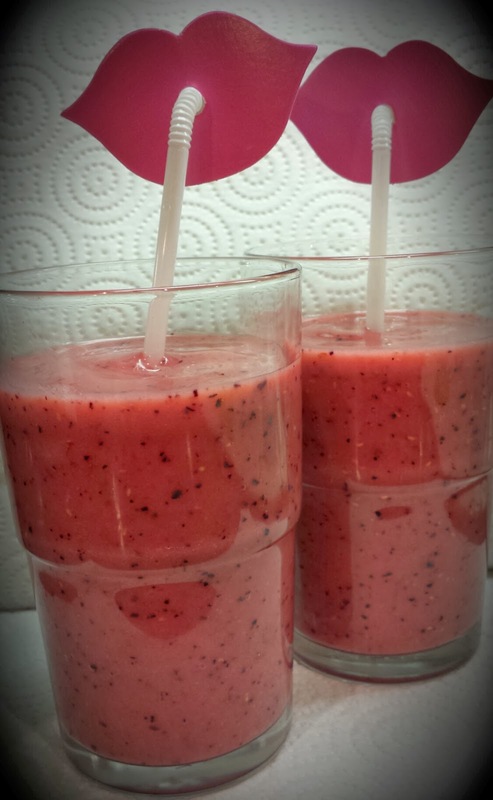 I have 2 kids that love fruit smoothies, so I make a 16 ounce one and split it between them. 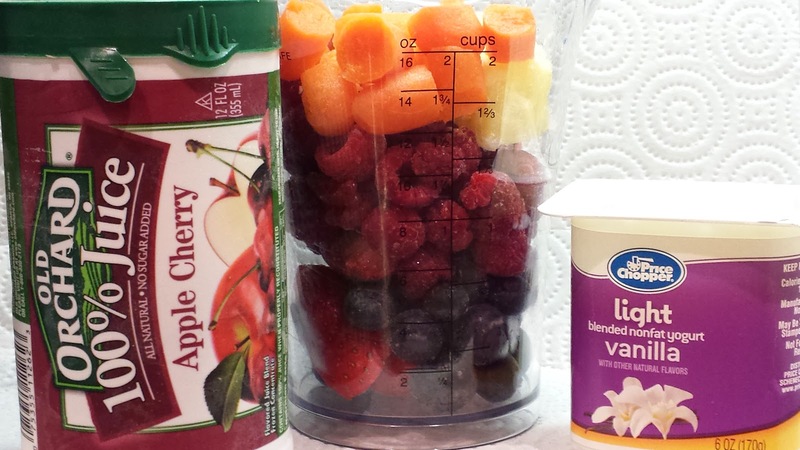 This recipe is totally changeable, but can still be packed with a bunch of colors for an array of nutrients! Once I put the fruit (and veggie!) in, I put in about 3 ounces (1/2 of the yogurt container/cup). Usually I use Greek yogurt, but this yogurt was free last week at my store! :) I use vanilla because I hate plain yogurt! Then, I fill the rest with 100% juice just until it ﻿meets the top of the carrots. Now, I have a Cuisinart Smart Stick hand blender thingy (you just stick it in the plastic cup shown and puree it like that). But, you can do this in your blender or Magic Bullet...whatever:) I blend away until it has a smooth texture. It comes out SO pretty AND SO yummy! My kids just chug it down...well, until they get the brain freeze going! But, they have NO clue that the carrots are in there. It is something small to add, but so important if they don't eat enough veggies. 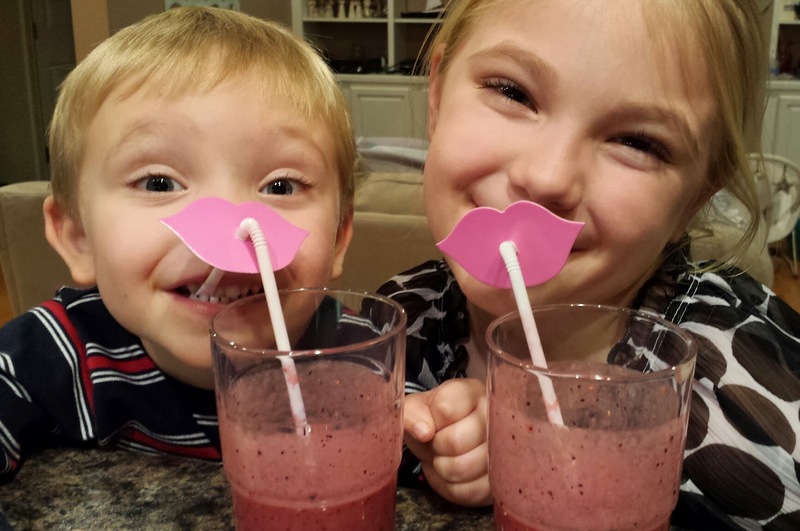 These smoothies have become a staple at our house. I am still going to experiment with the GREEN veggies, but I am not successful yet! Do you have a great GREEN smoothie you could share with me? I would love to try something that people have found to be successful! Pin and share on FB for later! This would also make a great Valentine's Day treat!